J.L. Aronson brings his documentary Last Summer at Coney Island to BAM. IF YOU BUILD IT: Director J.L. 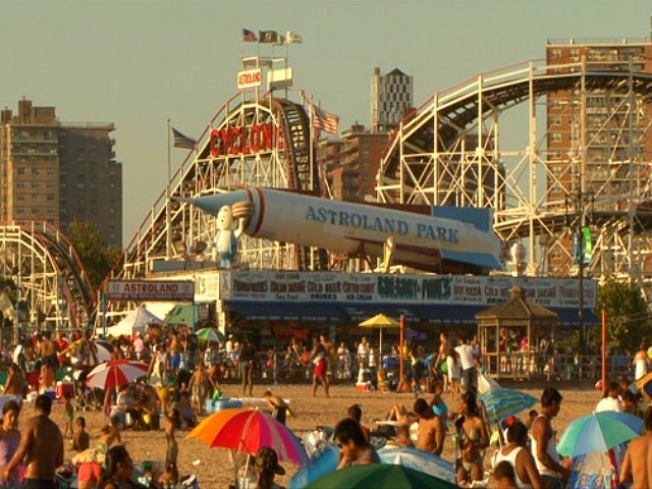 Aronson has spent a lot of time musing on the fate of Coney Island-as-amusement paradise, and his documentary Last Summer at Coney Island looks at both sides of the developers-vs.-preservationists argument. He’ll lead a Q&A after the BAM Rose screening of the film at 6:50PM. BLONDE AMBITION: Madonna’s career might not have been the same without the existence of this seminal artifact: Howard Hawks' Gentlemen Prefer Blondes opens at Film Forum, a handy reminder that diamonds are a girl’s best friend, Jane Russell is perennially underrated, there are very few showstopping tunes written about Little Rock, Ark., and you can never have too many sequins. See full schedule. CURD UP: Fromagers from Saxelby Cheesemongers and Formaggio Essex will curate a competitive tasting of their most sharpest, creamiest, most rump-slapping cheeses, paired with drinkables hand-picked by the wine connoisseurs of Slope Cellars and September Wines. RSVP to bittersweetsoursalt@gmail and they’ll send you the location. 8PM.